Anyone who is serious about their betting will need a measure to determine profitability. Expected value is a measure of the return expected over the long run. We cannot emphasis "the long run" enough. An expected value does not tell you how much profit each bet will make. Simply, that over many bets the EV will tend towards its expected value. The value returned will consist of the total return on a 1 unit bet, including the bet itself. Values over 1 show profitable returns and values below 1 are unprofitable returns, in the long run. Again, if the probability estimation is correct then the net loss over time will be 6.3%. In other words, for every 1 unit bet, you will only receive 0.937 units back. A losing proposition. Remember, EV tells you the expected return in the long run. Your first few bets could all be losing ones, especially if they are of low probability of success. 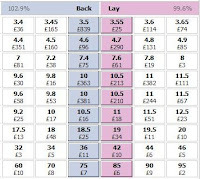 Likewise your initial bets could all be winners and your EV is far higher than expected. Expected EV is dependent on being able to accurately determine the odds of success. If your estimation is wrong then your EV will be a different value. If you have overestimated the probability of success then the EV will be lower and may actually be negative. Determination of true odds is the single most important task of the winning bettor. 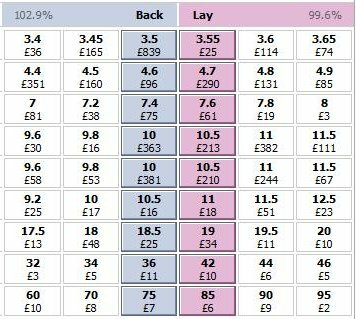 Given how efficient the market is at reflecting all known public and private information, would you agree with me that the only way in which a Betfair user will obtain value is if they have insider knowledge that hasn't yet been fully incorporated into in the market's price? There are two types of insider in Sports Betting. Well, a third if you include corruption. There is inside information hidden in knowledge that might have been overlooked by the crowd. Such knowledge is getting harder to find with everyone having access to data and computers to process the data. The second type is the "connection" who will know if, for example, a horse is entering a period of superior or inferior form. That is why I prefer to technical trade markets. Chaos theory impinges on fundamental analysis, which makes the whole process too long and tedious for me to attempt. Do you think betting value can be obtained by technical means (for example, by capitalising on market over-reactions by backing drifters and laying steamers)? I can't see why not. You just need to do the stats from a large sample and do the necessary calculations to see if there is a Kelly edge. I am working on a few articles about stats and Kelly. They will come out after I've finished some programming I'm working on. Looks to me that they let their position ride. I would be thinking of trading the momentum and getting out afore the off. Do you mean in terms of backing the market when it is steaming (and vice versa), and then closing your trade when the trend comes to an end? Now that would be getting too close to my own private information. Keep up the good work. You will get rewarded for it.